Kathleen Fearn-Banks, a tenured associate professor, joined the faculty of the School of Communications, University of Washington (Seattle) in 1990 after more than 25 years in the communications profession. In addition to being a feature writer at the Los Angeles Times and a news-writer, producer, and reporter for a Los Angeles network affiliated television station, she also headed, for more than 20 years, nationwide publicity campaigns for NBC Television Network series, specials, and movies. She was also vice-president of development and public relations for the Neighbors of Watts, an entertainment industry non-profit which raised funds for daycare centers in underprivileged areas of Los Angeles. In addition to her work in academia, Fearn-Banks counsels companies and organizations on crisis prevention, crisis communications, and helps them develop crisis communications plans. She is author of Crisis Communications: A Casebook Approach published first in 1996 by Lawrence Erlbaum Associates, Inc. with a second edition in 2002 and a third edition in 2007. The book is popular as a business as well as a university text and is used in more than 50 colleges and universities. In 2006, Scarecrow Press, Inc. published The Historical Dictionary of African- American Television which she wrote based on research and her many years of experiences in network television in Southern California. She is co-editor, with Anthony Chan, of People to People: An Introduction to Mass Communications published in 1997 by American Heritage Publishing, a division of Forbes, Inc. She wrote chapters for two books in recent years: “Crisis Communications: A Review of Some of the Best Practices” in Handbook of Public Relations, edited by Robert Heath and Gabriel Vasquez for Sage Publishing, 2000, and “The Crisis Communications Plan,” in Profolio:Crisis Management and Planning, PRSA Professional Practices Center, 1998. She has entries in the Encyclopedia of Public Relations (2005) from Sage Publishing. She has written numerous articles in journals, magazines, and newspapers. In 1999, she was elected “PR Professional of the Year” by the Seattle branch of the Public Relations Society of America (PRSA). In the Association for Education in Journalism and Mass Communications (AEJMC), she was elected by national vote to the Professional Freedom and Responsibility Committee and served as its chair. 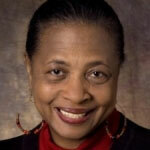 Also in AEJMC, she won the prestigious Baskett Mosse Award for research and faculty development in 1995. At the University of Washington, she developed a public relations sequence, created six courses, founded a chapter of PRSSA. She earned a B.A. in journalism from Wayne State University, an M.S. in journalism from UCLA, and completed the coursework for a doctorate in instructional technology from the University of Southern California. She is a member of the advisory board of the UW Extension Division’s Certificate Program in Public Relations. In Seattle, she has been a member of several non-profit boards. At UW, she is a member of the Faculty Council on Student Affairs. She is also a member of the Writers Guild of America, the Academy of Television Arts and Sciences, and Delta Sigma Theta (an international public service organization of African-American women).